The pipes of the town are broken ! 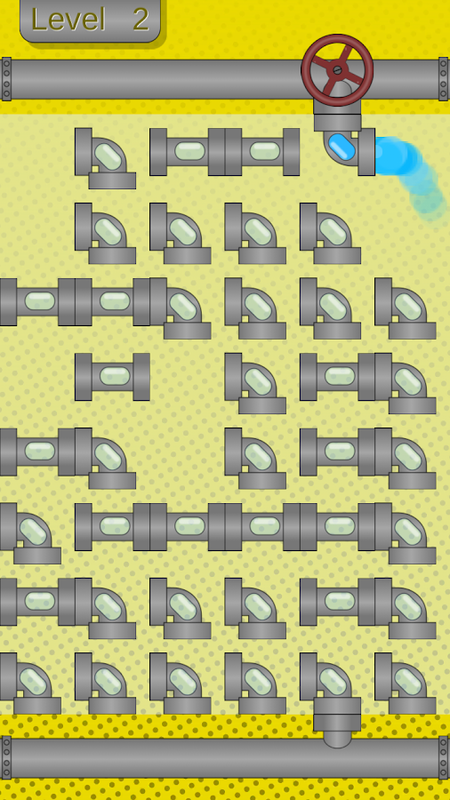 Quick, we need you to fix thebroken water pipes !Train your brain and find the right combinationto provide water to the town.Features:- 100+ levels (and more tocome)- Smooth animations- Nice music- A lot of funDownload it nowand start having fun ! Cut The Buttons 2 is the new version of Cut The Buttons.Themechanics are the same but it contains thousands of newlevels.Rules:Align 3+ buttons to make them disappear. Once thedenim board is cleared, the level is finished.The concept seemssimple but it is incredibly addictive and relaxing. Help the citizen of the town by fixing the broken water pipes.Enjoy yourself and train your brain with this fun and beautifulpuzzle game.Suitable for all ages. Play with your family. Relax and play the classic water pipes game with a lot of levels,no timer and absolutely no ads. Train your brain with this coolpuzzle game produced in association with Herjia. The game features:- Plenty of levels to play with your family - Smooth animations -Nice music - Wondeful graphics Have fun ! Turtle Swing is a fun game mixing mini golf and coconut shy.Grabtheturtle, pull, aim and shoot !Have fun with this completely newgamewith a unique gameplay. Puzzen is a logic puzzle game in which you have to alignsimilarshapes in the right order.Train your brain and play withyour wholefamily. Pipeline - is one of the best brain-teasers in this genre. If youlike puzzles, you must know that plumber - is one of the best freepuzzles. It is a well-known and favorite game in a new moderndesign with a rather absorbing storyline. We guarantee interestingtasks and exciting amusement. Peculiar features of the "Pipeline"game:- more than 100 free levels - from simple to complicated-completely suitable for everyone - puzzles for adults, puzzles forchildren- there are no time limits for you, but you are providedwith a limited number of moves in - each round, this will give youan opportunity to reveal all your skills and start up the braingame without the Internet - play wherever and whenever you want-task solving - is useful and always exciting The main aim of thegame is to plumb the pipeline. You just turn different pipes andplumb the pipeline. At first glance everything is very simply andeasily, but a right decision may appear not so simple among theentanglements of various pipes, branchings, taps and pressuresensors.The genre of the plumber game can be qualified as the bestpuzzle games for the brain, but at the same time, this is a puzzleadventure, a puzzle for adults and a family puzzle. That is why weare offering you our game, it does not only train your brain butalso helps to spend time easily, like the games in the genre of"Match 3" or Physics Puzzles. We have prepared superb missions foryou to be able to apply all your skills to the puzzles solving. Sothe game requires working out a strategy to plumb the pipeline byspending as less moves as possible. And then you will become thebest plumber in the Plumbers Rating! Develop a clear plumbingstrategy before you start to work with the pipes. A smart strategyis very important! The success of the mission depends on how youplumb the pipeline and how many moves you use. Find a realenjoyment in the plumber game. A little flower needs water to survive. Construct a pipeline andbring water to save the flower. Reveal your Plumber skills in thisfree puzzle game.Simply turn the different pipe pieces by touchingthem and connect them together to form a complete pipe.There is notime limit but you have limited moves for each round and you haveto save the flower before running out of moves (touching 1 pipe = 1movement). So think about a good plumbing strategy before you startworking on the pipeline. Good tactics are crucial!Plumber Puzzlecontains 400 free levels with an increasing difficulty.New levelpacks for your favorite plumber game. Now you can train yourself tobecome an expert plumber and also save a little flower. We supplythe pipelines , you discover the design. In the hottest desert water is a scarce resource. A little flowerneeds water to survive. Construct a pipeline and bring water tosave the flower. Reveal your Plumber skills in this free puzzlegame. 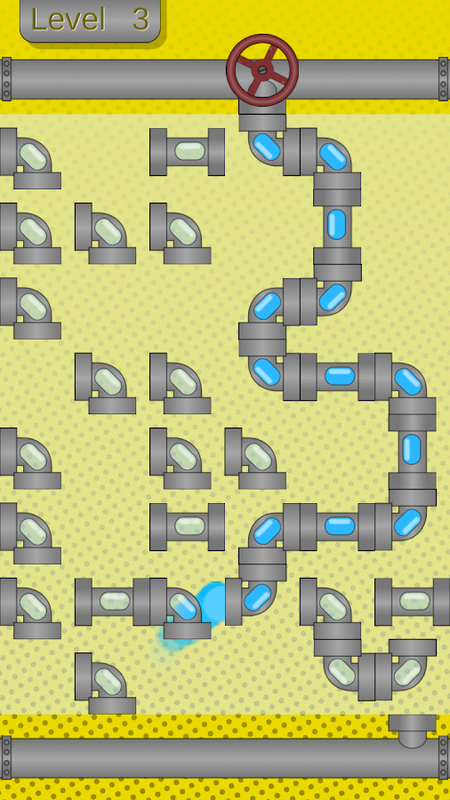 Simply turn the different pipe pieces by touching them andconnect all of them to make a complete pipe (that's the work of aplumber !) and make the water reach the flower ! There is no timelimit but you have limited moves for each round and you have tosave the flower before running out of moves (touching 1 pipe = 1movement). So think about a good plumbing strategy before you startworking on the pipeline. Good tactics are crucial! Plumber Puzzlecontains 200 free levels with an increasing difficulty andadditional level pack of another 100 levels! If you like puzzles,Match 3 games, riddles and brain games this one will also make youthink. This game is really fun and requires strategy to fix thepipeline in as few movements as possible to become the best Plumberin the desert! Water Pipes Classic is the one of the best logic puzzle games inthe market. 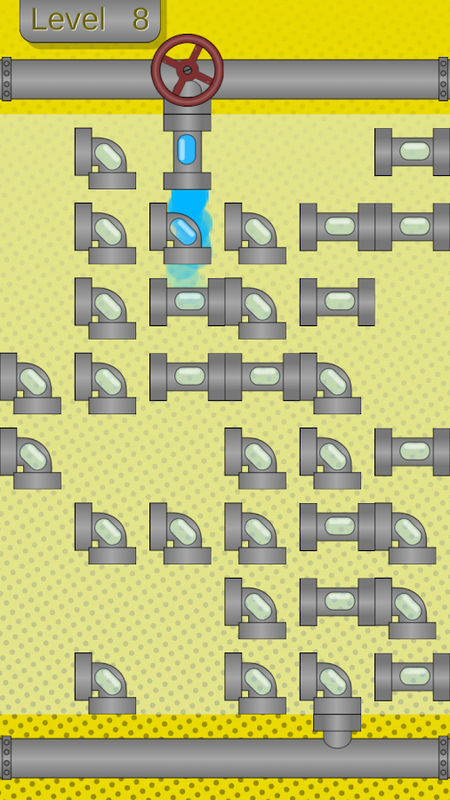 All you need to do is to rotate pipes, connect them andmake water paths. Touch the pies to turn them.Construct a waterpath from valve to container.Solve puzzles fast to collect morewater.Compete with others in your puzzle via Global Leaderboard.Tryto collect more water to beat all other players worldwide!You canalways use hints if you have got stuck in some level.Features:*500+ Fantastic levels* Nice graphics* Global Leaderboard* HintsystemThis game is without a doubt one of the best pipe connectiongames in the market. So what are you waiting for?Download WaterPipes Classic puzzle game for Free right now! Plumber is a free easy-to-use puzzle game with HD graphics in whichyour job is to prevent a flood from happening ! Simply turn thedifferent pipe pieces by touching them and connect them together toform a complete pipe. When you create a pipe, you will reduce theoverall water levels. Make sur you anticipate a possibleoverflow!Two game modes are available: - Arcade mode: adjust asmany pipes as you can before the water overflows (includingbonuses/penalties)- Challenge mode: evolve through a series ofvarying difficulty levels (200 levels) With Plumber, you have toshow adaptability by developing effective tactics to become anundisputed plumber! Time to fix leaks!